The music-themed expansions for Bushiroad�s Weiss Schwarz roll on with the Happy Happy Train Trial Deck and the new Love Live! Sunshine!! Booster Expansion, both releasing on May 18. Drawing inspiration from the Love Live! Sunshine!! 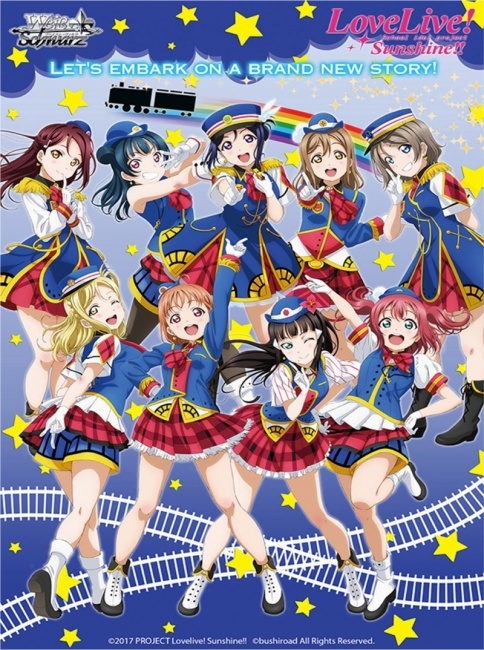 girls� third single �Happy Party Train,� the Happy Happy Train Trial Deck features the girls in railway-themed costumes. The deck follows Bushiroad�s �Neo-Standard� deck format, which is designed to appeal to both new and existing players, with every deck including two different Level 3 Characters and two foil cards. This trial deck has cards that can be combined with other cards that have numbers beginning with LSS, and includes multiple �Change� and �Brainstorm� ability cards. There are at least two copies of every card in the deck, allowing players to create a complete playset by purchasing two decks. The 50-card pre-constructed deck comes with 22 different cards. 11 different parallel cards will be randomly inserted into some decks, including 2 rainbow halo cards, 8 embossed character cards, and signature cards signed by voice talent Kanan Matsuura. Trial decks are packaged in six-deck displays. The Love Live! Sunshine!! Booster Expansion features the girls in costumes from �Mijuku DREAMER� and �MIRAI TICKET,� from the 10th to the 13th episodes of season 1. The 54-card set will be offered in six-card booster packs, packaged in six-pack display boxes. Each display will include one of nine different PR cards, and some random packs will have gold foil hot stamp SP signature cards with signatures from nine different cast members. The Love Live! Sunshine!! characters were featured in an expansion last year as well (see ��Love Live! Sunshine! !� Joins �Weiss Schwarz��). The game�s other musically-themed expansion planned for this spring, BanG Dream! Girls Band Party, has been delayed until July (see ��BanG Dream! Girls Band Party!� Joins �Weiss Schwarz��).